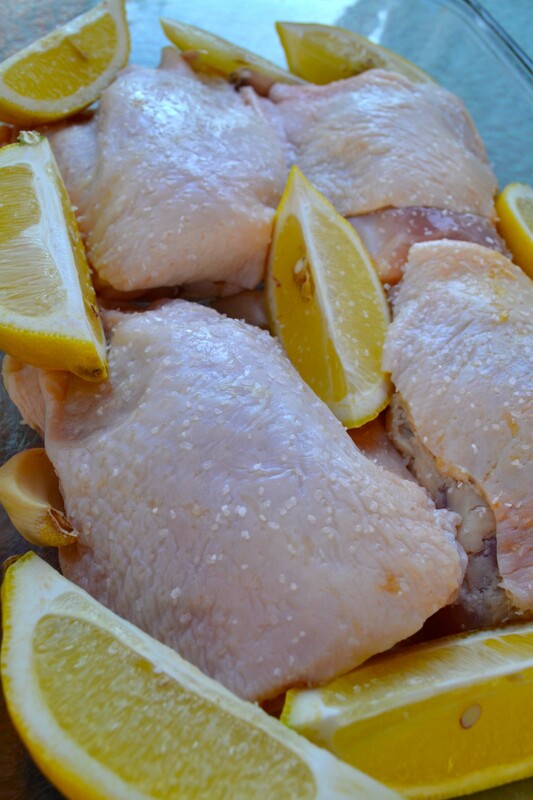 Chicken Thighs to Mesmerize | how 'bout some cake? Sometimes I really enjoy spending hours preparing a fabulous meal. There’s something cathartic about rolling out pasta dough or chopping mountains of veggies. Then there are most days of the week, when I wish my dinner would just cook itself. Here’s a recipe for most of the time. I’m not exaggerating when I say it takes less than five minutes to throw this dish together. 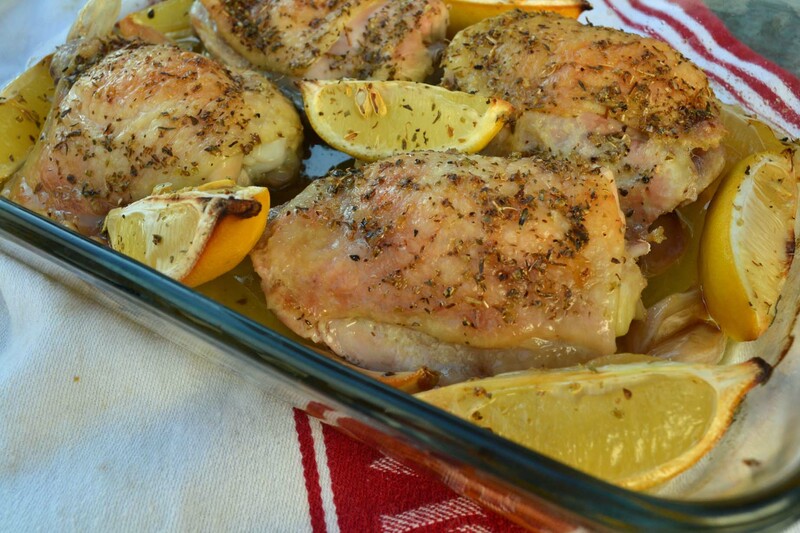 Pop it in the oven, watch a couple trashy TV shows, and enjoy a healthy and delicious meal. 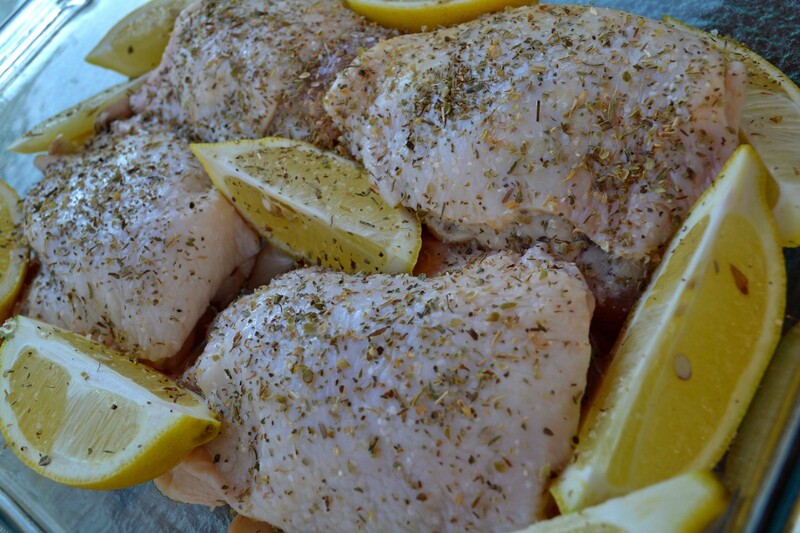 Start off by setting your oven to 375ºF (that’s 190°C). Break the head of garlic apart and drop it in the bottom of the pan. Don’t even bother peeling it. Take your two lemons and cut them in half, then half again so you’ve got 8 juicy wedges. 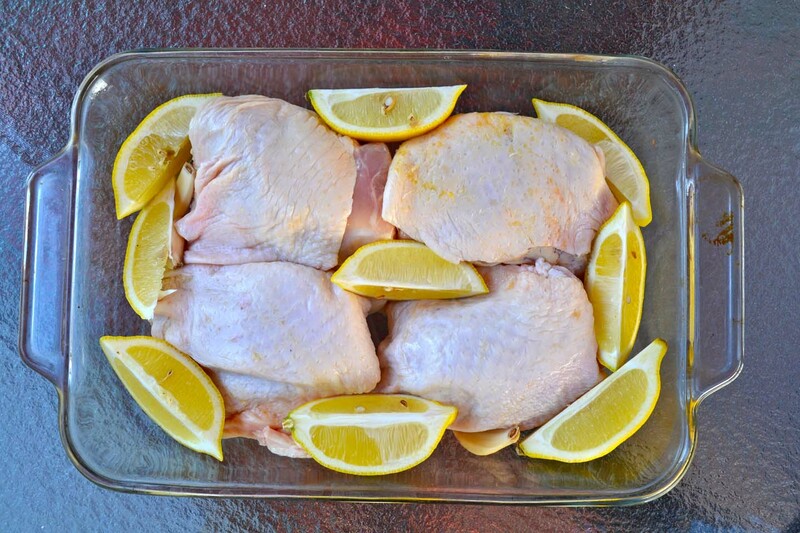 Drop your chicken in the pan and arrange the lemon wedges around it like so. Sprinkle with kosher salt and pepper. Then add a generous sprinkle of dried oregano. 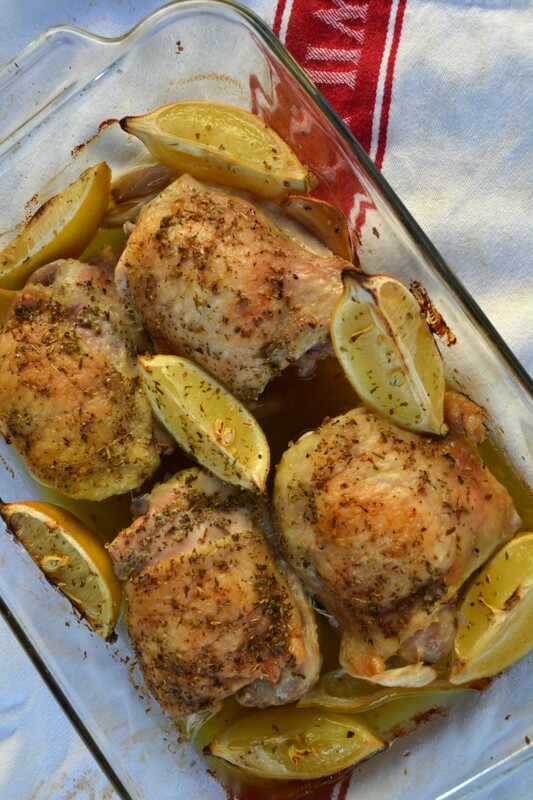 Add a generous drizzle of olive oil and pop it in the oven for about 50 minutes. Set your timer and do nothing but enjoy the delightful aroma of your dinner wafting through your home (and, of course, the requisite trashy TV). When the skin is crispy and golden brown, it’s time to pull it out and enjoy. 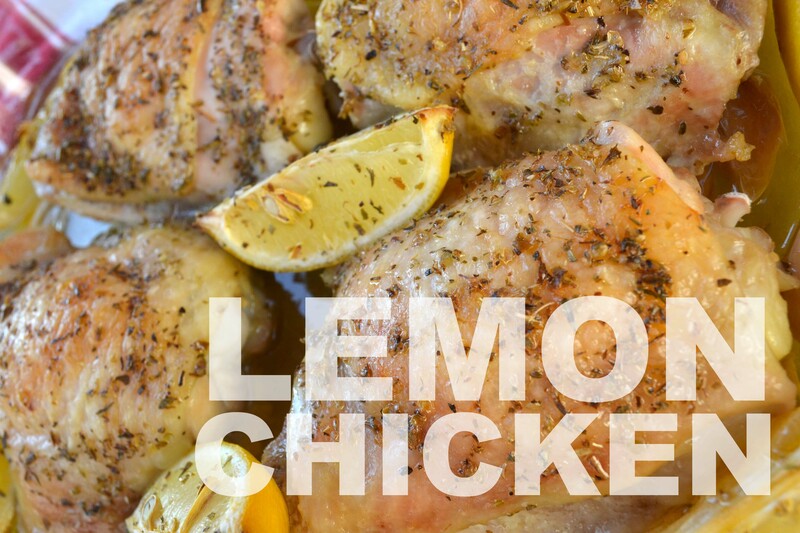 I recommend giving it a squeeze of the lemon and a bit of the roasted garlic with each bite. Props to my girl crush Rosie for the recipe! I’ll be back with more Greece photos soon! 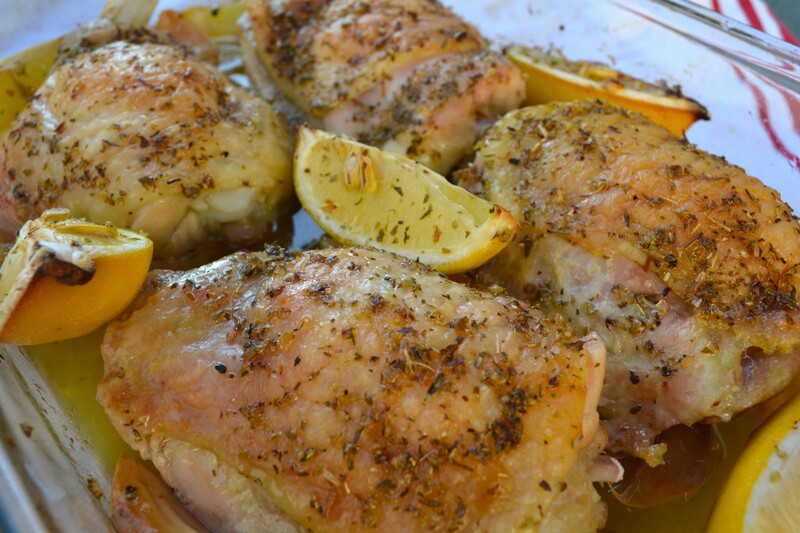 This entry was posted in Food & Recipes, Healthy meals & snacks and tagged chicken recipe, dinner recipe, easy dinner, easy recipe, healthy dinner, healthy dinner recipe, lemon garlic chicken. Bookmark the permalink. Adding this to the rotation. Sounds DELICIOUS!